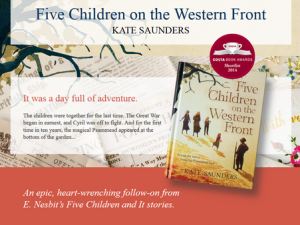 Kate Saunders has beaten off competition from Michael Morpurgo, Marcus Sedgwick and Simon Mason to win the 2014 category award with her WW1 book Five Children on the Western Front. The story is an undisguised tribute to the classic book Five Children and It by E. Nesbit however Saunders sets her story in 1914 with the children now older and involved in the Great War. The return of the magical Psammead after a ten year absence heralds the start of a new adventure which helps the children understand and cope with the horrors of the First World War. A sensitive and thoughtful story for ages 9+. Posted on January 12, 2015 by Curriculum Centre. This entry was posted in Book awards and tagged Book Awards, Fiction, World War 1. Bookmark the permalink.